New-Tech™ Fume Hoods are designed around your equipment to maximizes safety and minimize cost. Available in sizes ranging from 4 foot wide to 10 foot wide. Each sash is fully framed ensuring maximum protection. Sashes can be made to any size allowing optimum equipment access. Within any vertical sash, horizontal sashes/doors can be added to allow even easier access, minimizing exposure and saving energy. Standard Exterior finishes available are powder coated steel, Stainless Steel or Polypropylene. Optional pass through conduits allow for an easy and organized way to plug in equipment within the fume hood to face mounted receptacles. Each pass through conduit is covered with a low leakage flip cover. Optional Electrical and Plumbing fixtures can be shipped loose or Pre-Wired / Pre-Plumbed prior to shipment. Optional Magnehelic Gages can be shipped loose or Pre-Installed prior to shipment. Magnehelic Gages are used as an independent visual indication of airflow. 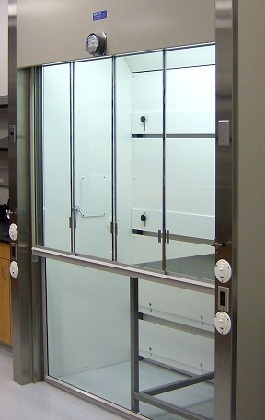 Optional TSI Variable Air Volume fume hood controls can be shipped loose or Pre-Installed prior to shipment. All New-Tech Custom Fume Hoods with Horizontally Sliding Sashes/Doors are designed to pass the ASHRAE 110 As Manufactured Test.